Ever heard of the Ripcurl Easter Pro? It is the longest running surfing competition in the world, and in the town of Torquay you can visit the popular host beach that has been attracting surfers from all around the world. The wild Southern Ocean is on show at Bells Beach. With the golden sand surrounded by cliffs, the picturesque beach has even earned a mention in a number of films and documentaries. Even if you are not a surfer yourself, the beach is a great place to watch all the action, and see why Australia is known for its surf beaches. After passing through Anglesea, you will arrive at Airley's Inlet. The small town is home to the Split Point Lighthouse, built in 1891. 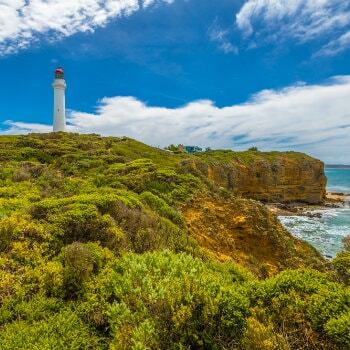 Not only will you get a window into the maritime history of Victoria as you climb to the top of the lighthouse, you will also be rewarded for your efforts with some fantastic ocean views. On a sunny, clear day, the colour of the water in the region is beautiful. Aussies might recognize the location from local children's program Round the Twist. If you want a classic tourist snapshot of the Great Ocean Road, don't miss the pull-in bay before the Great Ocean Road Memorial Arch. As one of the most photographed stops along the route, the area will no doubt be busy with tourists. The archway is also an interesting historical monument that details the process of building the road and pays tribute to the returned soldiers who were involved in its construction. Exploring the charming seaside town of Lorne is your perfect introduction to the Great Ocean Road. With beaches, plenty of nice cafes, an information centre, gallery and more, there are plenty of ways to immerse yourself in the town. Don't miss a stop at Teddy's Lookout for an unforgettable view of the Great Ocean Road from above. Any visitor to Australia will undoubtedly want to catch a glimpse of a koala. Even for locals the furry creatures can be quite elusive. Kennett River is a great place to see the iconic animals. You may be lucky enough to see them hidden away in the trees from the road, or you can head out on a walk to try and get up close. Another picturesque Great Ocean Road town; Apollo Bay will not certainly not disappoint. Get some fish and chips from one of the local shops and enjoy relaxing on the foreshore. Located at the edges of the Otways, the town has beautiful views. It is surrounded by a number of scenic waterfalls and rainforest walks. If you're in town on a weekend, enjoy shopping at the local markets. The Great Otways National Park is huge, and you could easily spend days exploring everything the park has to offer. 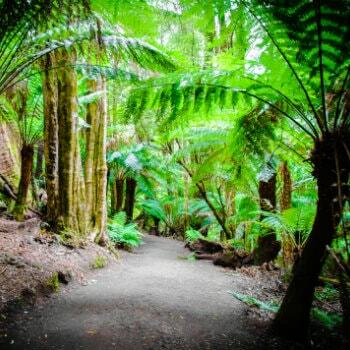 If you are short on time, or are just passing by and want a taste of the rainforest, pull in off the Great Ocean Road and walk the Maits Rest Rainforest boardwalk. For a slight change of scenery, head out on the boardwalk from Princetown to explore the area's unique wetlands. Following the Gellibrand River, from the platform visitors can see plenty of birdlife. Everyone has heard of Victoria's Twelve Apostles, and while the upper viewing platforms offer a fantastic panorama of the rock formations, escape the crowds and head down the Gibson Steps for an even more impressive view. The cliffs look incredible from the quiet beach. You can access the steps from the Twelve Apostles car park. There is no end to the fabulous scenery in Port Campbell National Park. One of the highlights of the park, is Loch Ard Gorge. Many visitors think it even rivals its more-famous neighbour, the Twelve Apostles. Follow the various trails to access lookouts of mighty rock formations, stunning, secluded beaches and even shipwrecks. There are three car parks from which visitors can access Loch Ard Gorge. VROOMVROOMVROOM RECOMMENDS: It is a good idea to spend at least two days exploring the Great Ocean Road. If you only have a short amount of time, travel to the 12 Apostles on the Princes Highway via Colac to save time. You can then complete your return drive on the Great Ocean Road at a slower pace.